Born on April 26th, 1970 in Düsseldorf/Germany, married, 1 child, Fachabitur (university studies), commercial education, journalist and author. 1999 awarded the title "Doctor Humanus Causa" by the University of Novi Sad/Serbia. By joining the Boxer Club e. V. based in Munich (FDH/FCI), Düsseldorf group in 1994 began a new phase of my life, which changed my life in a positive way. Already in 1995 I was appointed to the first chairman of the Düsseldorf group (BKVDH/FCI) until 2007. Since then is the love to the Boxers a part of my life. By the male Fausto von Santana (143 breeding uses) I got insights into breeding, which gave me the idea to protect "von Fausto" as kennel name. Knowledge of cynology I got inter alia by reading the books "Brevier neuzeitlicher Hundezucht", "Hundezucht 2000", "Die Hündin" etc. and by visiting breeding sites of successful international breeders in Italy, Austria, Spain, France, Belgium, the Netherlands, Portugal and more. In the meantime in the kennel "von Fausto" we had 44 litters. I had a good hand by choosing the breeding partners so that we had already some international and national champions, ATIBOX-Worldchampions, German champions of the year and country, European champions, different champions in other countries and on the "Performance sports page" participants of world championships and national country championships as well as several licensed boxers were born in our kennel. My rudes respectively rudes of my kennel were used for breeding for more than 500 times. In follow I was chosen to the First Chairman of the Düsseldorf group in 1998, 2001 and 2004. In 2007 I was nominated to the Honorary Chairman of the Düsseldorf group. Since 2003 the delegated of the country group 13 Rhein/Wupper (BK/VDH/FCI) trust in me and they awarded me to their country group chairman until 2009. In 2005 I was awarded to the "Zuchtwart" for special use by the Boxer Club e. V. 2006 I was confirmed as country group chairman. In 2003 I was elected into the board of the national association "VDH-Landesverband Nordrhein". There I am responsible for the areas breeding and dogshows until 2009. In 2006 I was nominated into the board as managing director. Excellent successes in the dog breeders' area were the gain of more than 200 champion titles as dog guide, owner or breeder of boxers. Inter alia: "Deutscher Jahressieger", "Klubsieger", "Bundessieger", Champion, 6 times ATIBOX World-Champion as well as various foreign champion titles. Four Boxers I conducted successful through the ZTP (breeding suitability test) and four through the AD (persistence test). One Boxer I lead in the performance levels BH, VPG (IPO) 1, VPG (IPO) 2, und VPG (IPO 3). I visited nationwide championships and breed surveys and I was a guest at several world and country championships. I managed four VPG (IPO) audits. At a lot of breed shows I took part as ring assistant, managed the reporting agency or was active as translator or breed show manager. In 2006 I was the local manager of the years champion breed show of the Boxer Klub e. V., the main event of the BK. In 2007 I was breed show manager of the national dog show (RHEINLANDSIEGER) in Rheinberg with a participation of nearly 3000 dogs of all breeds. 2007 Patron of the German Youth and Junior Championships Since 2004 I am continuously delegate at the general meeting of the ASSOCIATION TECHNIQUE INTERNATIONALE DU BOXER (ATIBOX) - cooperation partner of the FCI. In 2007 I was elected by the presidium of the world boxers association - ASSOCIATION TECHNIQUE INTERNATIONALE DU BOXER (ATIBOX) - as general secretary until 2010. I am the chief editor of the first edition of the international multi lingual boxer magazine "pro ATIBOX". In 2011 I was nominated as Vice President by the Boxer Club of Montenegro. In 2012 I`am National Judge for II FCI Group. Awards: In 1998 I received the golden badge of honor by the Finish Boxer Club. In 1999 I received the golden badge of honor by the Yugoslavian Boxer Club. In 2005 I became the Boxer Club Bulgaria made an honorary member. Awards in Germany: Silver badge of honor by the VDH Silver needle for special deserving by the BK 2006 golden needle for special deserving by the BK Boston Terrier: In 2005, my wife and I bought a female Boston Terrier dog. With this dog, we achieved several national champions titles. In 2006, my wife Saida Lemmer had to protect the kennel "von Fausto" by the 1 Club für Boston Terriers in Deutschland e. V./VDH. Until today we had three litters with them. I am married with Kenneth and we live on the countryside in the east of Norway with our three children. I have been involved in the dog world since I was a child, both my grandmother and mother has been active breeders, exhibitors and active in working in breed clubs and the Norwegian kennel club. My first dogs was a standard poodle, and it then went on to hunting dogs in group 7, weimaraners and Bracco italiano , it was my mother who first got in to hounds, her first Basset hound came in the house in 1990, and together with her I showed and worked several basset hounds, under the kennel prefix Voice of Baritone, she started up with lines from GB and Sweden , in 2005 I started with hounds of my own with my husband Kenneth, and we got the prefix Wenken, we have a very small breeding. Now days we do not have gun dogs , but in the house there is Basset hound, GBGV, Welsh Corgi Cardigan and some terriers. The whole family is involved on a daily basis. My commitments to horses and dogs have been life long, showing and working trails since I was a little childe, and I have worked for breeding, breed clubs and the NKK since I was eighteen. I have had several positions, in the Norwegian Basset club, but for the last five years I have been the president of the club and still are, I am also a president in the Norwegian Boston Terrier club, strongly involved in the council for Brachycephalic breeds in the NKK, and for the second year I am in the board of the Norwegian Kennel club. 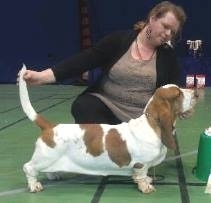 My first authorisation as a show judge was in January 2017 on Basset hound, and I am now authorised for 15 breeds in-group 6, and still a student for several moor breeds in-group 6.